I've been continuing on with Zachary's alphabet theme, but in the next few weeks I'll also be 'testing' and reviewing some other curriculum, so the alphabet theme might be put on hold for a week or two while I post about the new curriculum that we are using. 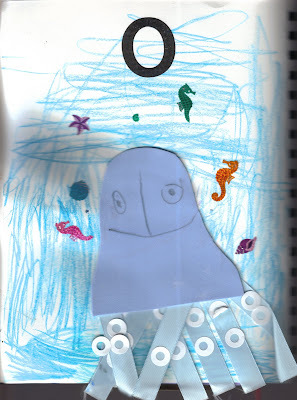 'O' ended up being mainly for 'octopus' this week, so the ocean theme was plentiful in our house. I cut an octupus shape (of sorts *grins*) out of blue foam and we added ribbons and white paper reinforcers on as the 'tentacles' and legs of the octupus. The main page was colored like water and we added on some other ocean themed stickers so that the octopus had a little company in the water. What isn't there to love about water, strange sea creatures that expand when they are put into water, rocks meant for a fish tank and fake seaweed? Just remember to hot glue the top of the water bottle shut - or you might just have a big, fat watery mess on your hands. Not that I speak from experience or anything. Not me. Paint mixing and color mixing can be especially fun when attempted with a four year old who refuses to sit still. We all know that red + yellow = orange. Red + orange + Zachary = a big mess and paint everywhere. We set out some small bowls of Cheerios this week and had Zachary try to guess how many were in each dish (his answers were hysterical). We then counted out 1:1 to see how many were actually in the dishes. We pulled out our pattern blocks too and had fun making octagon patterns together. We'll learn them one by one. Sad ones make a frown. And then slide down, down, down. "Oh, give thanks to the Lord, for He is good!" I gave you an award!! Come by and see it at http://www.homeschoolblogger.com/momof7kids/. Love this site! Thanks for all the great ideas! 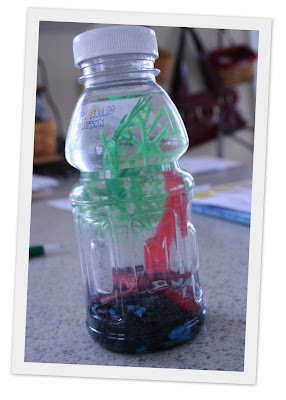 I used this one for my beach craft ideas this week - with a link to your blog! Hi there, just have to say I use so many of your ideas because they are brilliant! 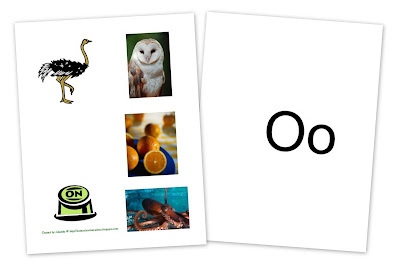 I downloaded your Letter O collage sheet this week and we linked back to you! (actually we've linked back to you for lots of other stuff too.) :) Thanks!